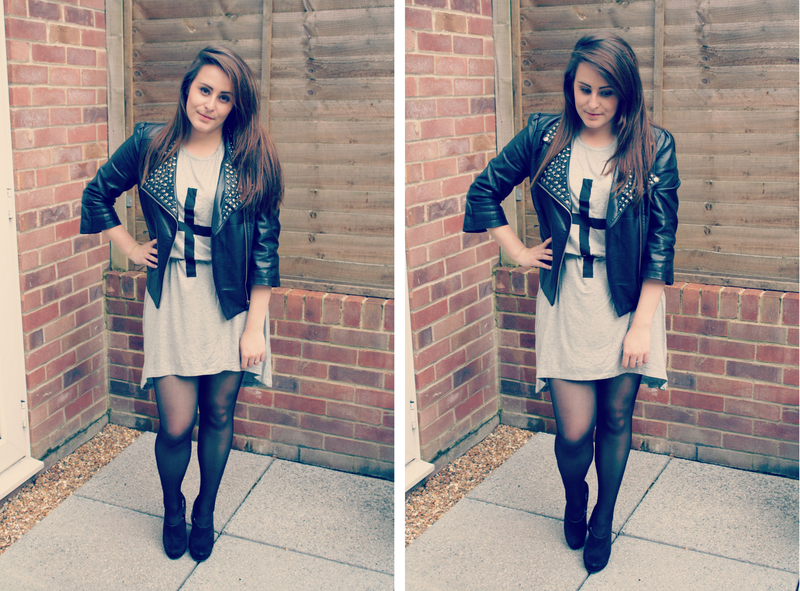 Yay another outfit post. What are your thoughts on me doing outfit posts, do you like, or shall I just stick to the beauty stuff? Answers on a postcard please! These were some quick snaps before I headed out yesterday to a surprise get together shindig for one of my school friends. It had just started to rain, hence the not so smiley smiley photographs! Embracing my inner rock chick I paired this Grey cross dip hem vest tunic with my trusty faux leather (an obvious choice, I live in this jacket!) and some wedge shoes for a bit of height! Those of you that have been fortunate to have met me, know just how short I am. At a gigantic 4ft 11 means that sometimes certain items of clothing dont look the way they 'should' on me. This was the case with this tunic/top. As a vest, this came up way too long on me so I knew instantly a waist belt would add shape, shorten and add definition to the outfit. By whacking on the thin belt, hitching up the top half of the vest so it hung over the belt (still lining up with the bottom of the cross - I hope you've noticed, attention to detail and all that jazz!) it gave the tunic top a completely new look. It works best on me as a loose baggy dress rather than a vest top. The way I have styled it makes it shorter, therefore more flattering on my tiny frame. Therefore it looks as though I am wearing the tunic, not the tunic wearing me! I love your outfit posts :) It's so great how you added the waist belt to make the tunic work for your height! You look wonderful! The studs on that jacket make it the perfect mix of rocker chick and chic! I literally live in my leather jacket come fall--love yours! I love the studs on this leather jacket, it's gorgeous! How to : Ladybird Nail Art Tutorial. Review : Sally Hansen Mega Shine Top Coat.